If you’re like me, you probably thought Spore’s innovative creature creator could have been much more malevolent. Oh sure, being able to place arms and tails on your customizable creatures is nice and all—but what about giving your creature swords? Or flame-retardant armor? That’s just the start of Maxis’ new sci-fi action role-playing game, Darkspore. On Tuesday, Electronic Arts officially previewed Maxis’ expansive online-only co-op game. Mostly known for developing Sim City and Spore, Maxis’ latest game appears to be darker, more violent, and more cooperative than what we typically see from the iconic developer. At first glance, the game resembles a sci-fi dungeon crawler or Diablo in space: You must recruit the best warriors from across the galaxy, collect DNA, upgrade your arsenal, and wage war across the surfaces of infected planets in an attempt to stop a powerful evil. But to just label this game a Diablo clone would be misleading. Sure, like any dungeon crawler, you’ll collect lots of loot. But you’ll place it on your character just how you’d like, thanks to Darkspore’s customization system that is “inspired” by Spore’s creature creator. Similarly, you won’t be a single hero fighting an entire army. Even while playing solo, you’ll have a squad of genetic heroes you can bring to a specific mission. You’ll want to employ strategy to figure out which creatures you bring along, because each has unique abilities that you can use to complement the rest of your squad or your fellow players. In the demonstration at Tuesday’s game preview, a creature with a teleportation ability helped his teammate teleport to an elusive target and then rip it to shreds using a flaming melee attack. When Darkspore arrives on the Mac in 2011, you’ll command a squad of genetic creatures, each with their own unique abilities, against enemies who boast their own particular strengths. Your enemies will have different abilities, vulnerabilities, and buffers as well. Your attacks on an enemy of the same type will be less effective because the enemy has resistance to its own kind. You’ll want a complimentary squad, with creatures that can augment each others’ powers to handle a variety of enemies. Darkspore promises a strong potential for replayability, according to Mike Perry, executive producer of Darkspore. “Every time you play, you’ll confront different [non-player characters].” The enemy-AI may decide to deploy different non-player characters with different tactics depending on how you’re playing. Advanced players can therefore expect advanced challenges. 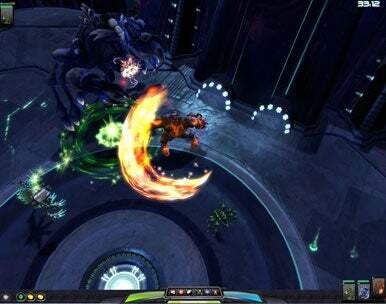 The most surprising element of Darkspore is the game’s focus on cooperative combat. You and up to three friends can play together, each bringing a squad of creatures to the battle. If you don’t have friends to play with, the game’s service will quickly match you up with suitable players. Some enemies and situations essentially demand cooperative combat—during Tuesday’s demonstration, an enemy trapped one player until a friend freed him. Darkspore is due out in the spring of 2011. The game will be available on both Windows PC and Mac platforms though Electronic Arts hasn’t revealed specific system requirements.